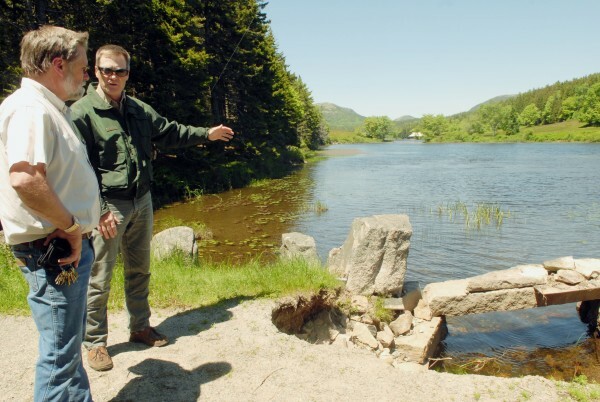 Regional Fisheries Biologist Greg Burr meets with Doug Hopkins (left) at the outlet of Little Long Pond in Seal Harbor in this June 14, 2012, file photo. MOUNT DESERT, Maine — A century after his father donated land on Mount Desert Island to preserve it for public use, David Rockefeller Sr. is following in his footsteps. 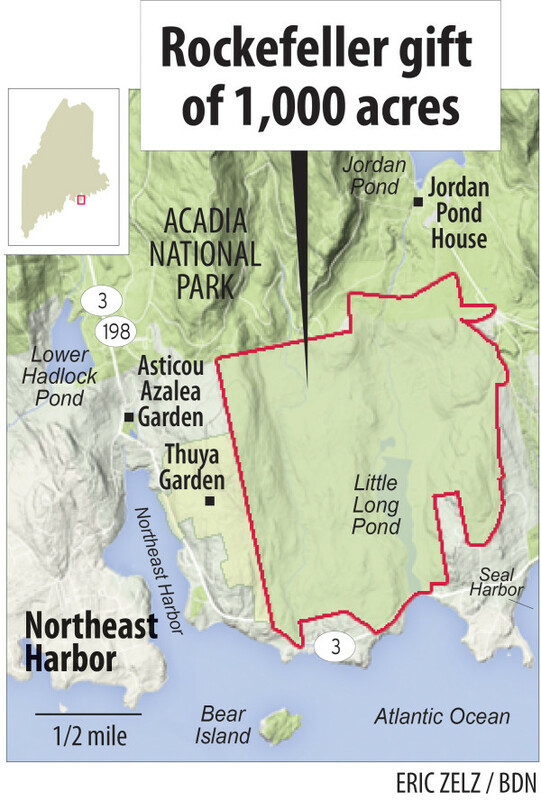 On Thursday, the international banker and philanthropist announced he is giving away approximately 1,000 acres of land on MDI to the Mount Desert Land and Garden Preserve. Rockefeller is making the gift, which consists of land surrounding Little Long Pond between Northeast Harbor and Seal Harbor, in conjunction with his 100th birthday next month. Rockefeller’s father, John D. Rockefeller Jr., made a fortune in the oil business and is one of the founders of Acadia National Park, having donated thousands of acres of land to the park in the early 20th century. The land and garden preserve has consisted primarily of two gardens in the local village of Northeast Harbor: Asticou Azalea Garden and Thuya Garden and Lodge. The land being added is one contiguous parcel that lies in between Eliot Mountain, which is part of the Thuya Garden property, to the west and Stanley Brook Road to the east. It abuts Acadia National Park and includes carriage roads, hiking trails, fields, woodland and streams. The gift does not include the Abby Aldrich Rockefeller Garden, which is located between Little Long Pond and Seal Harbor. According to a prepared statement released Thursday by Rockefeller, Abby Aldrich Rockefeller Garden “will be made public in the future.” The release does not say when the transfer of that property will take place. The gift of roughly 1,000 acres of land to the preserve is expected to be completed this summer. Neva Rockefeller Goodwin, Rockefeller’s daughter and head of the preserve’s board of directors, thanked her father in the statement for his generosity. Rockefeller, whose birthday in on June 12, is one of a handful of billionaires who summer on MDI, but he is the only one whose family has been among the island’s wealthy rusticators for generations. David Rockefeller’s parents, John D. and Abby Aldrich Rockefeller, first bought a seasonal home on MDI in 1910. 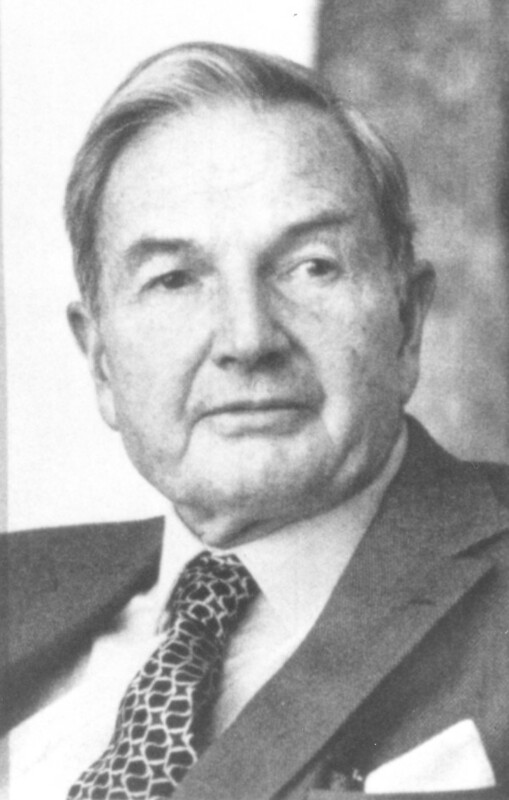 According to Forbes, which each year compiles lists of the wealthiest people in the world, David Rockefeller Sr. had an estimated net worth of $3.2 billion in 2014, ranking him as the 207th richest American citizen. By Forbes’ estimates, Rockefeller is the oldest living billionaire in the world. Charles K. Savage, a lifelong Northeast Harbor resident who preserved the plant collection of renowned landscape architect Beatrix Farrand, built Asticou Azalea and Thuya gardens with financial support from John D. Rockefeller, Jr. The Asticou Azalea Garden, created in 1958, is patterned after a Japanese stroll garden with many traditional Japanese design features adapted for the natural setting and vegetation of coastal Maine. The Thuya Garden, created in 1960, is an expansive, semi-formal herbaceous garden in the style of English designer and author Gertrude Jekyll, as interpreted for coastal Maine by Ms. Farrand. It sits on land given in trust to the people of Mount Desert by Joseph H. Curtis in 1928.